Terrain: 'Real' hill-running in places (i.e. bog, pathless, gradient, higher summits), some rough trails, but a lot of easy running (road/forest track) too. Transport: SPT/Stuarts have a good service No30/31 to Wanlockhead from Lanark Station. There's no regular Service to St. Marys Loch (see note below). This is a tough 40 mile section along the way. It doesn't just have a bit of everything, it has a lot of everything! Of interest is the fact it contains the highest point of the route (Lowther Hill 725m), and also crosses Scotland's Watershed - the true West/East divide. If like myself you're running the S.U.W. over multiple stages, an easier alternative (with public transport servicing the termini) is to split this section at Beatock/Moffat, and then run Beattock to Traquair another day (13 miles beyond Tibbie Shiels). Going against the grain of my previous two outings on the Southern Upland Way, I chose to go West to East this time. A generally iffy forecast with gale-force winds made it clear which way would be more enjoyable. I also wanted to finish this in daylight, and tackling the Lowther Hills first, whilst fresh, made more sense. I felt the usual pre-run excitement as I parked up in Wanlockhead. I got the feeling my dad didn't envy me as I leaped out of the car into the breezy February air (it wasn't the sort of day you can just "step" out of a car!). He was off geocaching down the old road towards Moffat, and we'd arranged a rendezvous point at an old bridge somewhere past Moffat around 1:30pm. Wanlockhead deserves much more attention than it got from me today. I was on a bit of a mission here, by choice, it was going to be a tricky balance between running gently enough to enjoy my day and appreciate the surroundings, and also getting to the pub before darkness (now there's incentive!). Sure I had my new Myo headlamp with me but that's not the point. The route starts climbing immediately from "go", and so I warmed up nice and quick and found myself very quickly in "the zone", a nice rythym going up to the summit of Lowther Hill with its military golf ball on top. Then it was into cloudy lonliness down the otherside. As the cloud rolled back I got a nice view down the jaws of a fairly dramatic-looking pass which I've since learned to be "Dalveen Pass" on the A702 above Durisdeer. I would eventually meet the A702 once the way had done a big-dipper over another "Lowther" hill, turn NE along a squelchy ridge then drop down to a farm. A short section of the way follows this road, but traffic is light, there's plenty of room, and actually I enjoyed stretching the stride out for a bit. Then back off into rough land to cross a river and pick up an easy flat trail, eventually track, towards Daer Reservior. The route seems to have changed since my map, the marker posts now guide you up onto the dam, all very pleasant, then straight up the steep hillside which took me completely by surprise! The route arcs over rounded, windswept slopes to 561m Hod Hill, taking the line of a fence. Again the going was squelchy (although there were flood warnings across Scotland this weekend after a stormy few days), before dropping steeply into Ae Forest. I just wanted to enjoy charging down the hillside, which I did at first, but unfortunately it got tricky lower down with up to several inches of mud/water and fallen trees to negotiate. At certain points the Way could have been mistaken for a burn. Welcome to Dumfries and Galloway! I passed the sign for a bothy (Brattleburn)- hidden somewhere up in the trees off the route I guess, then another climb up a fire break but never steep, and even with all these trees around I could sense civilisation was near. 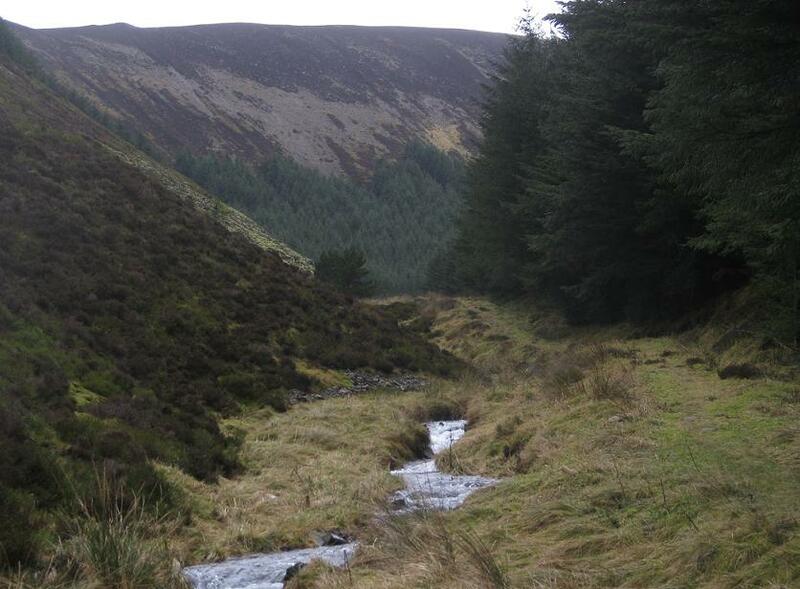 (See picture of bridge - the Southern Upland Way is the river on the left). Soon I came upon a nature-trail way-marker, then some walkers on it, then finally a carpark at the top of Crooked Road. That section had been tougher than I thought so I was a fair bit behind schedule for meeting up with my dad at 1:30pm. I hate schedules - they should be banned at the weekend! Anyway, I picked up the pace and to be honest enjoyed doing so, it was downhill tarmac with great views over Annan Dale and Moffat. I could already hear the M74. It felt good to get past the M74, and onto a nice lane, another unexpected hillock, then some very pleasant riverside running to Drumcrieff Bridge where my dad was waiting, but thankfully not for too long as I'd arrived on time! Flask of tea, and loads of junkfood that I could induldge in guilt-free. 20miles to go, again into new territory, and looking forward to it. It became immediately apparent on departure that I'd been a bit greedy at the car, and my stomach was having to work as hard as my legs. It is a sustained uphill into the forested hillsides anyway, so I just settled into a slow plod for a bit. There's a lot of forest around these parts, a lot of lonely, hilly, misty wet conifer forest. Hello, is there anybody in there? No other walkers/runners/cyclists that's for sure. The hills seemed to have huddled around me and there didn't seem an obvious way out that didn't involve a lung-busting climb. The scenery improved significantly as a waymarker put an end to the forestry road and took me onto nice grassy singletrack beside a tumbling burn, progressing out of the trees and into a wonderful den of steep hillsides at the head of Selcoth Burn. Probably my favourite part of the day's run (see title photo) it wasn't long before I was at the East/West watershed, marked by a fence, a style, and a sign welcoming me to the Scottish Borders (and Dumfries and Galloway for those heading the other direction). Then down to another bothy, a very tidy looking and accessible bothy, before reaching the top of the tarmac road that I'd be following for about 7 miles down the glen of Ettrick Water. It was pleasant enough to run down this - probably a bit of a drag to walk - and the only car to pass me was when I was 100m from the style that would take me back Northwards up into the hills for one last time, just five miles to go to that pint by the loch. I managed to keep a shuffling run up the steep hillside, then a nice track was reached that followed a very pleasant, gently-angled gully N towards Scabcleuch Moss (now there's a name!). With over 35 miles in the legs I had finally descended into "just get there" mode, yet I must have been paying attention because I took quite a few photos (unless they were just excuses for a rest). As usual there was one final dip and rise to negotiate before reaching the top of a dirt road that descended to the loch and the well-earned pint of Guinness.